The study of embryonic, transparent zebra fish. A million-dollar-plus portfolio managed by students. One of the world’s most reputable business competitions. Endowed faculty positions and numerous student scholarships. All these University of Oregon advances are due, in part or whole, to the generosity and foresight of the recipients of this year’s UO Pioneer Awards — Tim Boyle, CEO of Columbia Sportswear, and his wife, Mary, a Portland philanthropist and a member of the Board of Regents for the University of Portland; and Gerry Cameron, retired CEO of U.S. Bank. Established in 1979, the annual award recognizes distinguished UO supporters who have been outstanding in business, philanthropy, communication, politics and the arts. This year’s event takes place May 18 at Castaway Portland, 1900 NW 18th Ave.; visit the event website to register. University supporters, faculty, students and Portland community members will honor the recipients and help the best and brightest students from Oregon attend the UO through the Pioneer Award Presidential Scholarship. Proceeds from the event will benefit the Presidential Scholarship Endowment. The Boyles are longtime supporters of the UO. 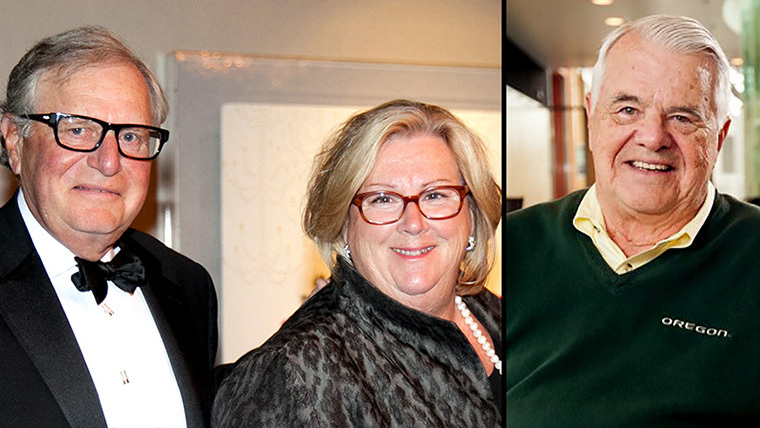 Tim Boyle has helped lead Columbia Sportswear for 46 years, and Mary Boyle is an admired philanthropist, arts supporter and advocate for higher education. Both attended the UO. A year ago, the couple gave $10 million to endow the UO’s aquatic animal care facility, where the Institute of Neuroscience maintains 80,000 zebrafish and supports research in 10 biology laboratories. The gift will pay for state-of-the-art instruments and a facility expansion. The Boyle’s $3.5 million gift to the New Venture Championship through the Portland Programs at Lundquist College increased the grand prize purse to $20,000 and expanded the scope of the competition to include high school students. The endowment also let students in the School of Journalism and Communication create a media program and campaign book for the championship through the school’s Allen Hall Advertising agency — experience that has helped many students land jobs. They also endowed the Tim and Mary Boyle Chair in Materials Studies and Product Design in the School of Architecture and Allied Arts. Cameron attended the UO on a work-study scholarship that launched his career at U.S. Bank. He gave his support to the Investment Group, a UO student organization that manages several portfolios worth about $1.5 million and provides student experience for future employment in the financial sector and on Wall Street. With his wife, Marilyn, the Camerons also created the Marilyn C. and Gerry B. Cameron Center for Finance and Securities Analysis in the Lundquist College of Business. And the couple have helped hundreds of students across the state through their investments in scholarships. For complete biographies of the recipients and information about the awards gala, see the Pioneer Awards website.